Born in Cumberland County, Pennsylvania, in 1775, James Carnahan attended the College of New Jersey with the class of 1800 and maintained close ties to the institution throughout his life—serving as a tutor at the college after graduation and studying theology under President Samuel Stanhope Smith. After his ordination as a Presbyterian minister, Carnahan founded a seminary in Georgetown, Washington D.C., where he resided for eleven years and owned at least two slaves. Upon his return to Princeton as college president in 1823, Carnahan oversaw a period of conflict and low enrollment but continued to serve in the role for thirty-one years with the aid of John Maclean, Jr.—the vice president who would eventually succeed him as president. Under Carnahan and Maclean Jr., the Princeton Alumni Association was founded in 1826 with James Madison (alumnus and former President of the United States) at its head. Increased engagement with alumni improved the college’s finances and allowed Carnahan to invest in new faculty and reverse the downward enrollment trend. 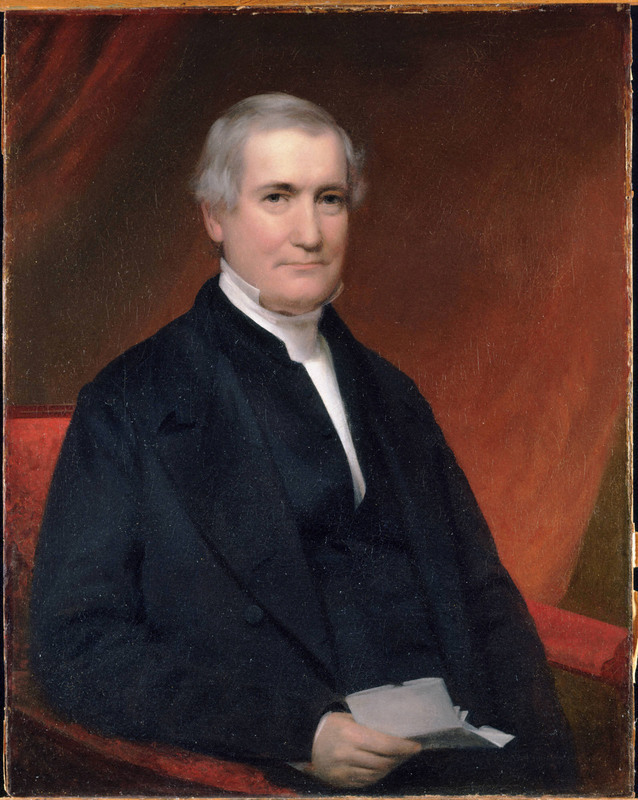 Portrait of James Carnahan, Princeton's ninth president. Federal census data reveal the evolution of Carnahan’s household and his personal ties to slavery over the course of his career. In 1820, while living in Georgetown, Carnahan owned two slaves—one male and one female, both under 14 years old. When Carnahan, his wife Mary Van Dyke, and their daughters Lydia and Hannah moved to Princeton in 1823, they may have brought one or both of these slaves with them. In 1830, the federal census recorded the presence of one male “free colored person” between the ages of 10-24 in the Carnahan household, possibly the same young boy who had been enslaved ten years earlier. If so, perhaps Carnahan felt compelled to free him after moving to a free state; New Jersey had passed its first gradual emancipation law in 1804. 1820 census entry for Princeton president James Carnahan, who owned two slaves while living in Georgetown, Washington D.C.
Another decade later, in 1840, Carnahan’s household included two female “free colored persons,” one between the ages of 10-24 and one between the ages of 24-35. By 1850, the census listed Ethel Crees, age 15, and Caroline Crees as members of the Carnahan household, with Caroline described as “Mulatto.” Since the names of household members were not included in earlier census data, whether or not Caroline was one of the women mentioned in the 1840 census remains unknown. 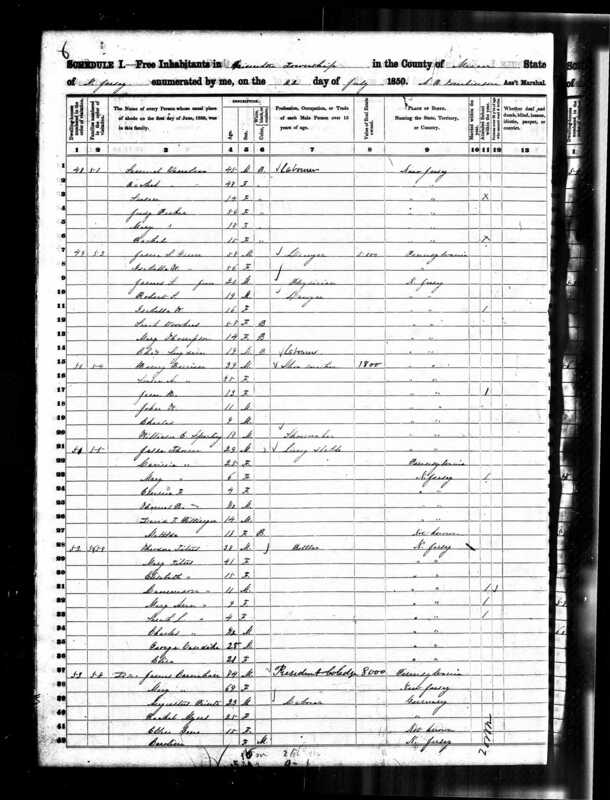 1850 census entry for Princeton president James Carnahan, who employed "free colored persons" in his household in Princeton. As an alumnus, president, and later trustee, James Carnahan’s ties to the College of New Jersey provided a powerful platform from which he could promote colonization in the Princeton community and the state of New Jersey more broadly. Alexander Leitch, A Princeton Companion (Princeton, NJ: Princeton University Press, 1978), 81. Francis Bazley Lee, ed., Genealogical and Memorial History of the State of New Jersey (New York: Lewis Historical Publishing Company, 1910), 273; John Frelinghuysen Hageman, History of Princeton and Its Institutions, Vol. 2 (Philadelphia: J.B. Lippincott & Col, 1879), 274. 1820 Federal Census, accessed 21 March 2017, www.ancestry.com. 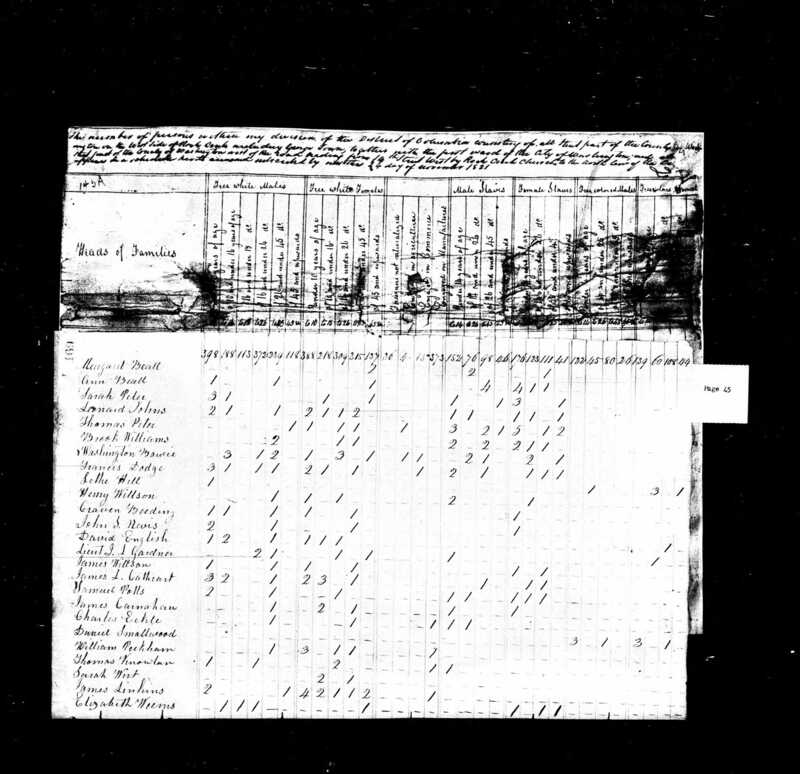 1830 Federal Census, accessed 21 March 2017, www.ancestry.com. 1840 Federal Census, accessed 21 March 2017, www.ancestry.com. 1850 Federal Census, accessed 21 March 2017, www.ancestry.com. Craig Steven Wilder, Ebony & Ivy: Race, Slavery and the Troubled History of America’s Universities (New York: Bloomsbury Press, 2013), 263. The Ninth Annual Report of the American Society for Colonizing the Free People of Colour of the United States (Washington, D.C.: Way & Gideon, 1826), 72; The Tenth Annual Report of the American Society for Colonizing the Free People of Colour of the United States (Washington, D.C.: Way & Gideon, 1827), 99; The Eleventh Annual Report of the American Society for Colonizing the Free People of Colour of the United States (Washington, D.C.: James C. Dunn, 1828), 99. Nathan Reingold, ed., The Papers of Joseph Henry: The Princeton Years, Vol. 4 (Washington, D.C.: Smithsonian Institution Press, 1981), 183.